I have posted before (and here) on people attacking Traditional Catholics; here is what appears to be another example. I say 'appears' because Fr Longenecker's target is not clearly identified. But what happens when the people are forgotten and all the emphasis is on rubrics and rules and liturgical finesse and ecclesiastical fine-ness? There is a danger that it all turns into a precious religious ceremony for the liturgical elite. I've heard of parishes where the music is so fine and the ceremonial so refined and the servers so meticulous and the liturgy so correct that ordinary people are repelled by it all. They are not connoisseurs of brocades and birettas, Lassus and lace; Mozart and maniples, and when the liturgy gets so high and mighty it only makes them feel low and lowly. Really? People are repelled by Mozart? Well, there are a couple of things to be said here. First, Fr Longenecker is not talking about Catholics - priests or laity - attached to the Traditional Latin Mass. He doesn't in fact even mention it, though he refers to 'radtrads', whatever that means. 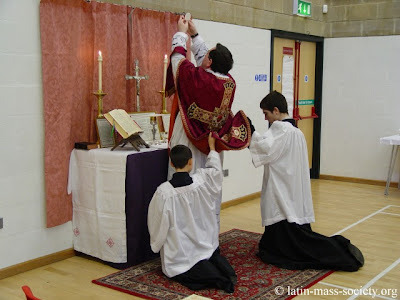 It clearly isn't the form of the Mass which is at issue, but the embellishment and presentation of the liturgy. The fact is, the long period in which the Traditional Mass was available only in hotel reception rooms and the like purged the Traditional movement of people who were only in it for the lace. I myself started going to the usus antiquior in a meeting room in the West Oxford Community Centre. We later graduated to the sports hall in the same building, as shown in these photographs (there are more here). (And this was with the full permission of Archbishop Vincent Nichols.) 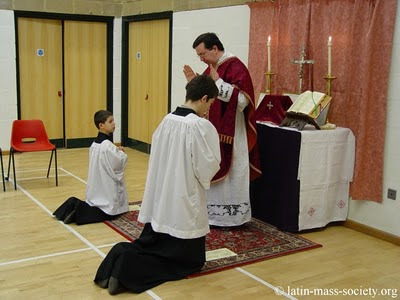 The more solemn presentation of the liturgy is something we may desire, but it is still pretty rare. How many places in England and Wales have Mozart or Lassus at the Traditional Mass? Once a month at St Bede's Clapham Park, and on an occasional basis at the London and Birmingham Oratories. Once a year in a handful of places where there are Latin Mass Society pilgrimages. I actually don't think the USA is all that different: the kind of liturgy Fr Longenecker is referring to is rare, certainly in the context of the Traditional Mass. 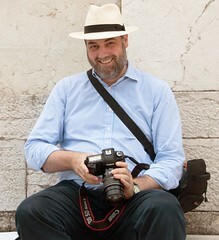 Reading the blogs - like the New Liturgical Movement - might give a different impression, but the point is that those blogs lap up these splendid occasions because it is NEWS. It is because - as they sometimes remark in the comments - the vast majority of readers can't get anywhere near that kind of thing themselves, that they want to read about it. When these events do happen, pretty well everyone is very pleased; numbers on these occasions indicate that there is pent-up demand for Mozart and his ilk. If Fr Longenecker has met people who are put off by it, why do they go, for heaven's sake? They still have the other 99.99% of Masses to choose from. However, he has identified something real: there really are people who don't like it. I spoke to one parish priest who said that when he first wore a Roman chasuble - at an English Novus Ordo Mass - one of his parishioners told him afterwards that it made her feel physically sick. One can only speculate that it was associated in her mind with a lot of things she didn't like - doctrinal orthodoxy, for example. (She would certainly be getting that from this particular priest!) But what are we to say to people who have that kind of reaction? The fact is that the reaction of a whole set of Catholics to certain liturgical practices is pathological. It is connected with deep psychological complexes, linked to their experiences of the liturgical changes, the permission liberal theology may give their lifestyles, their roles in parish life, and a host of other things. We have to have compassion, and we have to deal with local situations as gently and pastorally as we can. But we can't let these reactions stop us restoring to the liturgy the dignity it deserves, and for which most Catholics long, any more than the deep dread of facing up to old sins, on the part of some people, should stop the Church offering us Confession. We need Confession: the lady in the story even more than the rest of us. We need to restore dignity to the liturgy, and although the people who object will probably go elsewhere when it is done in a particular parish, in reality they need it more than anyone. The people who think they can relate to God only in the context of rainbow vestments and pottery chalices have clearly lost the sense of the His transcendence, and this is going to have a bad effect on their spirituality, their theology, and their lives as Catholics. If the liturgical restoration spreads to the point at which this kind of Catholic is forced to confront his inner demons, that will be a good thing. But they can relax: it won't be soon. Once again, Mr. Shaw, you neatly smash the opposition's arguments into atoms. This isn't the first time Fr. Longeknecker has tried to swing fists at traditional minded people and try desperately to be funny about it at the same time. A very nice response, Mr. Shaw, to Fr. Longenecker. I think you've well diagnosed the problem. How sad that people find it offputting to give what is best and beautiful to God. 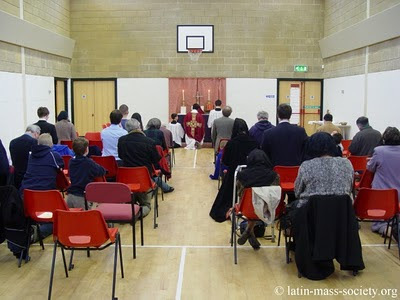 I recently attended the Latin Rite confirmations at Spanish Place, and it is really uplifting to see these ceremonies performed well, with beautiful singing and full ceremonial. Fr Longenecker has some peculiar views. Daphne MacLeod wrote a critique of some booklets he did for the CTS here. Did any of you commenters bother to read the original post or did you just swallow Mr Shaw's biased comments on a passage taken out of context? I've read both. Mr. Shaw is basically correct. Fr. Longnecker should stop "shooting at his hunting buddies" and using terms like rad trad to tag people who only want to worship as the Church did for centuries. Mr. Shaw no doubt realizes that some of the most antagonistic vitrolic being spouted in the name of Jesus' Church against those who don't see things their way comes first from the co called readtrad and in all honesty it's hard to out do them. <span>Ah the usual anonymous accusation against un-named persons! You'll have to do better if you are goin to accuse OTHERS of 'vitriol' and not merely exemplify it yourself.